In August 2013 Retrotrials.com was very very very very lucky to meet 1996 Outdoor and three times Indoor World Champion Marc Colomer to carry out an Exclusive interview for this Web site. 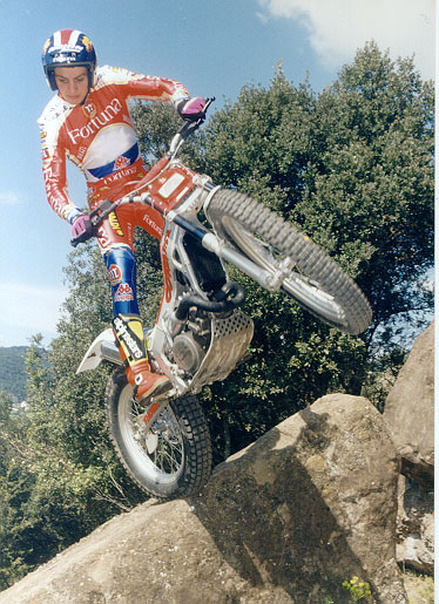 Trials fans have all enjoyed watching the superb riding style of Marc Colomer throughout his successful career. Marc is a rider who just felt and looked perfectly at home on a trials bike. As soon as Marc swung his leg over and stood on the pegs he would stand there and balance as if on stabilisers. This incredible natural balance was coupled with modern riding and trick skills developed in Trialsin, finding great success riding cyclo trials. As we all know, nothing in the world of trials comes easy and without practice. With a great foundation of skills "in the bag" it left Marc to get on with the task of riding his motorcycle, perfecting his sport with the increased confidence that many other riders could only dream of. Marc helped push the skill and difficulty of trials to a new higher level. A level that perhaps some riders felt difficult in raising their game to. His leg waving and low stance on the bike was unmistakably Marc Colomer. It was this style, courage and balance that won a huge amount of events ranking him as one of the most successful trials riders of all time. Marc's success was well earned and brought with it a large number of new younger generation trials fans and followers keen to see the old guard overthrown by the new boy in town. His young looks, flamboyant leg waving and aggressive style earned the spectators and fans support. Marc's immaculate Garibaldi clothing, the technically impressive new Montesa Honda machines and the massive cigarette sponsorship deals projected Marc's image Worldwide and tapped into the huge interest only Honda can generate. He was the perfect young trials star. Throughout his career, Marc always came across to those that didn't know him as a cool, serious, professional and understated character and a man of few words. He didn't chase the attention or limelight and he was happy letting his riding do the talking. Marc was also a very private man and came across perhaps as a little shy. Try finding any information from Marc Colomer himself about his time in the trial. It just doesn't exist. There isn't any. This is why this interview is so special. It is literally the first time Marc Colomer has ever sat down and spoken on the record about his time in the trial. It gives a fascinating insight into the World Trials scene from his point of view. What I found when meeting Marc (many years after the trial, I grant you), was a man who is very happy with his life, confident and sure of himself. Marc answers questions precisely and directly, with out the stories. I get the feelings he is a man who has moved on from the trial and left it far behind in the past. He has moved onto other things and another career. Trials was a moment, but now is also another. Marc has travelled the full length of the road in trials. Above all, Marc appreciates his privacy a great deal. Thank you Marc for this interview. When I was thinking about making arrangements to meet Marc, I had no idea if he spoke English or not. I just didn't know. My Catalan isn't very good, so my friend Josep Argerich stepped in and made the telephone calls to Marc. When I book these appointments they usually go one of 3 ways. The first way is that I make the call and it is very straight forward. A date is talked about and we speak a couple of days later to confirm. The 2nd way, is that we speak and the person doesn't know their movements and it's a bit in the air. The third way is that they might take my telephone number to call me back. The feedback that I got from Josep was that Marc thought it was a little strange that a man from England wanted to come all the way to see him and talk about these old days in the trial. Josep explained that yes, the man from England is a little strange but that I had been to Spain many times before on similar missions. There was still however some suspicion and a little hesitation from Mr Colomer to fully commit to a meeting. Josep agreed that he would call Marc again in 1 month to see how his diary looked then and perhaps book something up. Josep called again and things were looking better but there was still a little strange wonderment and suspicion from this World Champion. Still no date was booked and the planned trip to Spain with several rendezvous was only 1 week away. I left this with Josep. He is a very organised man and doesn't let things slip. You don't have to remind him about things, he knows what to do. Well I think at this stage I was beginning to wonder if this meeting was ever going to happen. I knew already that Marc was illusive. He had just moved house and he had told Josep that his house wasn't properly organised enough to show us around. Still no date and time ! :) I was a little worried. Soooooo. Now I am on the plane to Barcelona with no appointment confirmed to meet Marc Colomer. It was really 50/50 whether it would happen the next day as had been suggested. The next day I met Josep at Masia de San Antonio the home of the Bulto family. At the moment I had just picked myself off the floor after seeing Eddy Lejeune's works Merlin, I spoke with Josep and asked him "Is the appointment with Marc happening later today ?". Josep replied that he had to call him as no commitment had been made. This was right down to the wire, it really was. My times in Spain are so packed with places to go and people to see that I'm not able to fit it in at another time. Then, the break through. Josep spoke with Marc from San Antonio. 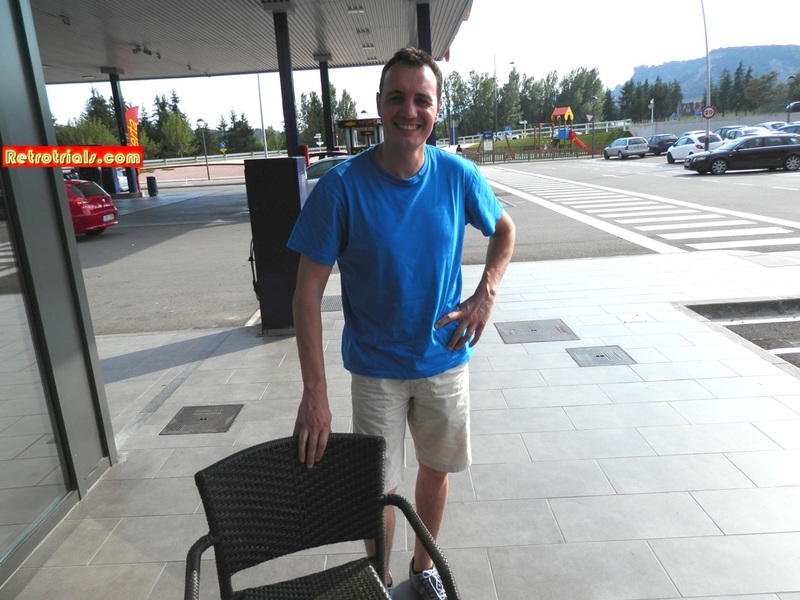 Marc said that he was on his holidays and he would come up from the beach where he was with his family and speak with us. This was brilliant. We were to meet Marc Colomer. No, it wasn't going to be at his house because he was still getting organised from his move and also because he was on holiday. So we met at a garage and drank strong coffee. We arrived early of course. I wasn't going to miss the chance of meeting World Champion Marc Colomer, one of the most illusive and secret men in trials, oh no. Then Marc arrived in a sleek low down silver Japanese sports car. You'll know what it is. Meet Marc Colomer - Im sure you'll agree, he hasn't changed a bit. So Marc, would you like an Expresso ;) ?